Founders’ Day was celebrated in great pomp as per the Northfields tradition on Friday 6th October 2017. 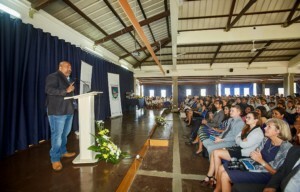 Students were recognised or their wonderful academic achievements as well as their sporting and cultural talents. We also had three excellent performances by Aidan for a poem recital, a short story by Jayden and a song by Saphia and Aaron. Our guest of honour this year was Mr Robin Mardemootoo, Attorney-at –Law and founder of SPEAK. A number of special nominations were awarded on the day to staff and students which makes our Founders’ Day ever so special. 1st – Louis M. – Joint 2nd – Diotime P. and Ilona K. – 3rd – Krystina K.
1st – Robyn A. – 2nd – Maria F. – 3rd – Amber F.
1st: Aislin C. – 2nd: Aashika C. – 3rd: Aurelie T.
1st: Elise S. – 2nd: Yasmine J. – 3rd: Candice P.
1st: Shankaren M. – 2nd: Jonathan T. – 3rd: Rohan T.
1st: Rohan T. – 2nd: Megan A. – 3rd: Domenico S.
1st: Christopher P. – 2nd: Liam B. – 3rd: Ryo J. 1st: Sakshi P. – 2nd: Saakshee R. – 3rd: Grace T.
Yr 10 – Tein M.
Firas D- Georgianna G.- Jasmine H.- Kayla M.- Sacha – P.- Michael P.- Hugo P.- Adam S.- Habiba S.
Business Studies & Design and Technology: Thomas E.
Chemistry, History, ICT & Physics: Habiba S.
First Language English: Leah C.
English as a Second Language: Hugo P.
Environmental Management & Geography: Kayla M.
First Language French: Rohan T.
Foreign Language French & Literature: Adam S.
Business Management & English B (joint): Alban L.
Chemistry & ESS: Francois M.
Physics & Geography: Christopher P.
French B & History (joint): Liam B.
English B (joint): Matteo S.
Biology & Chemistry: Grace T.
Business & Economics: Sakshi P.
Physics & Advanced Information Technology: Irfan C.
Geography & History: Luc L.
Yr 7- MALE: Sebastian K. / FEMALE: Jenna R.
Yr 8- MALE: William L. / FEMALE: Uliana D.
Yr 9- MALE: Malcom D. / FEMALE: Arissa D.
Yr 10- MALE: Noah G. / FEMALE: Aurélie T.
Yr 11- MALE: Stéphane D. / FEMALE: Millie B.
Yr 12- MALE: Hugo W. / FEMALE: Hannah B.
Yr 13- MALE: Liam B. / FEMALE: India S.
Junior Overall Sportsman: William L.
Junior Overall Sportswoman: Jenna R.
Senior Overall Sportsman: Liam B. Senior Overall Sportswoman: Aurelie T.
Junior Sports Personality Boy: Dillon S.
Junior Sports Personality Girl: Maria F.
Senior Sports Personality Boy: Haashim D.
Senior Sports Personality Girl: Roxanna N.
Leadership Cup – Cynan C.
Service Award – Yaadav R.
Cultural Award – Max R.
Yvon Emile Cup – CJ W.
Northfields Cup – Shankaren M.
Overall Top Ten – Cyrus P.